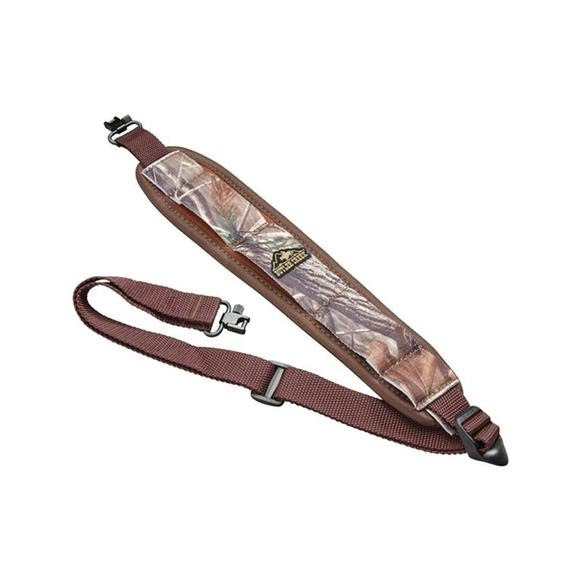 Stretchable construction and soft padding soak up the bounce you get with traditional slings, reducing felt weight up to 50%, so even the roughest hikes are smooth on your shoulder when you employ Butler Creek's Comfort Stretch Sling. Stretchable construction and soft padding soak up the bounce you get with traditional slings, reducing felt weight up to 50%, so even the roughest hikes are smooth on your shoulder when you employ Butler Creek &apos;s Comfort Stretch Sling. Mossy Oak® Break-Up® camouflage features unprecedented depth, unequalled detail and elements with remarkable contrast, offering hunters another dimension in camo. Mossy Oak® Break-Up Country® uses dramatically larger limbs, leaves, bark, branches and other digitally enhanced elements to fuse hunters with their terrain. As the Official Camo of the National Wild Turkey Federation, Mossy Oakâ€™s Obsession pattern includes the NWTF logo and true-to-nature elements from the spring woods.